I wish all the animals were as lucky as my dogs and cats, warm and snug, all cuddled up on the couch. But the sad reality is too many dogs and cats aren’t lucky enough to have a warm, loving home. Here is one such survivor- meet Logan.We just rescued him over the weekend from a horrible situation in Augusta, Georgia. He’s safe now, recovering in our care, but there are another 25+dogs there, in just as bad of shape or worse. I first heard about Logan and the other dogs last week when a rescuer named Teresa reached out to me. She explained the abandoned dogs had been living together in the woods behind a strip mall in Augusta. 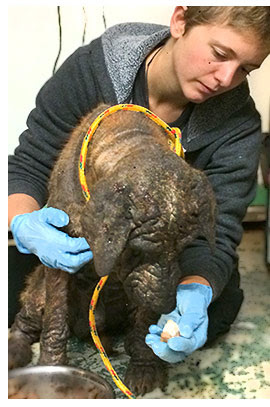 That all the dogs are in pitiful shape, riddled with severe mange, some with old injuries including broken bones, sleeping in piles of garbage, and scavenging for food. The dogs are all shy and fearful- very difficult to catch. Teresa’s rescue group had teamed up with another local rescue to try and trap the dogs. They’d been at it daily for two long weeks and not having much luck with the trapping efforts. With the bitter cold coming, they reached out to us for help. Eric formed a plan with the local groups for Brother Wolf to manage the trapping efforts ongoing. And since the two local rescue groups have limited resources to care for all the dogs, we agreed to bring them back to Asheville for medical care and recovery. If the rest are like Logan, the medical rehabilitation will be a long process for sure. Logan’s skin is so badly infected that his poor little feet were bleeding every time he took a step. Our medical staff said he was falling asleep standing up, as they tried to examine him. Poor guy- he’s exhausted from months, if not years, fending for himself out in the woods. Audrey, our Adoption Center manager, says that while Logan is scared and shut down right now, I can see a magnificent dog in there- when you look into the depths of his eyes. We will keep you posted on Logan’s recovery. And we’ll keep you posted on the trapping efforts as well. If you are interested in fostering one of these dogs during their long term recovery, please email foster@bwar.org. If you can’t foster and want to help with the costs associated with trapping, rescuing, transporting, and rehabilitating these dogs, please donate today.